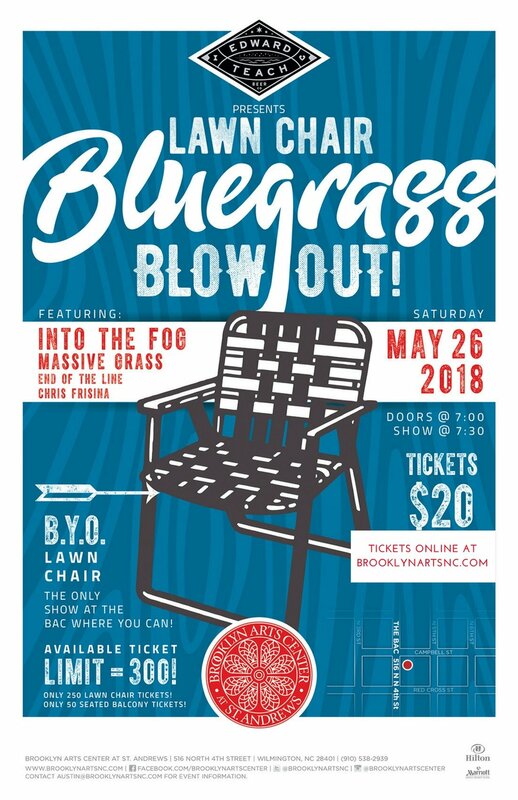 Edward Teach Brewing presents The Lawn Chair Bluegrass Blow Out at Brooklyn Arts Center, featuring live performances by Into the Fog, Massive Grass, End of the Line, and Chris Frisina. This is the only show of the year where you can bring your own lawn chair into the BAC. Only 250 lawn chair tickets are available, plus a very limited number seated balcony tickets. Doors open at 7 p.m. Tickets are $20 in advance, and $25 at the door. BAC Cash Bar, The acclaimed A&M Red Food Truck, and Free Parking. Official After-Party next door at Edward Teach Brewing, immediately following the show. Live music, free lawn-chair-check on site, and door prizes.